The Crystal Sea is a family run fishing operation worked by the Stevens family. 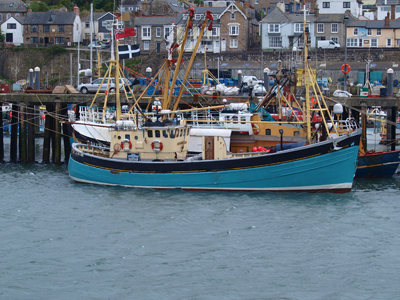 The family originated from St. Ives and have been fishermen for many generations; hence the vessel being registered to St. Ives as ‘SS 118′ which is an old family registration number, although she now works out of Newlyn. As David junior recalls, “One of the family’s boats was The Rose of Sharon II FR 23, which was built by my grandfather Ernest Stevens in 1969 at Forbes boatyard Sandhaven near Fraserbrough in Scotland. This was the second vessel that my grandfather built, the first being also named Rose of Sharon SS 118 which was built in 1965. My dad started working with his dad in 1965 aboard the first Rose of Sharon and he went on to work the second Rose Of Sharon with his brother Paul”. Skippered by two brothers, David and Alec Stevens, with a crew of three others and their father helping ashore with the nets and supplies; the Crystal Sea goes to sea for 3-5 days depending on the weather, maximising the quality and freshness of their catch. The Crystal Sea catches a diverse mix of species and many of the fish caught and landed are non quota species (other species that are quota are considered to be stable). To further reduce its environmental impact, the Crystal Sea works a twin rig net arrangement to increase efficiency and minimise fuel consumption. In a nut shell, David and Alec’s fish is very high quality and sustainably fished. To see how fish is caught and landed by the Steven’s Family, visit the Crystal Sea’s website. Although it bears a Scottish registration (UL), The Celestial Dawn was built in Cornwall in 1989. Over 2 decades later, the vessel was returned to its birth place where Peter Green and his crew, breathed new life into it once again. A s Peter recalls,”After returning to Falmouth approximately 12yrs ago and ending up lying neglected and downbeat in a boatyard for 2yrs, I purchased the vessel (The Celestial Dawn) and a full restoration began“. Peter has transformed the Celestial Dawn and increased its efficiency after a series of restoration works. With their great care and devotion, the Celestial dawn works in the Cornish sea with confidence and pride. To take a virtual tour of the Celestial Dawn, visit St Mawes Seafoods’s website. Peter comes from one of the oldest fishing families from St Mawes, with a community where life revolves around the sea. With local skipper Jon Sawle aboard the Inter-Nos local side trawler, Peter had his first days fishing at the tender the age of nine and has never stopped. Ever since that first trip to sea he is was ‘well and truly hooked’ by the ‘tingling excitement’ of fishing. Whenever the weather allows, Peter can be found off the coast of Cornwall – nets in the sea….fishing!. Nearly 40 years later, Peter is still landing ‘low-impact fish’ from a vessel which is worked efficiently to avoid unnecessary discards- creating a sustainable environment in which to, as Peter says, ‘carry on in the future, as we have in the past‘. 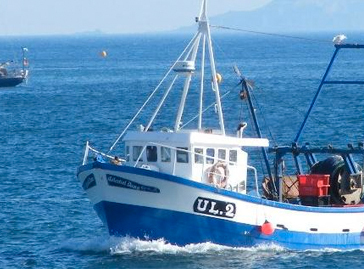 “It depends on what grounds we are working as to what shellfish we catch. Off the Dodman (a point south of Fowey), we tend to catch lots of crab. If we are hauling our inshore gear lobsters are on the menu for us!”. Alan and his crew start early, at around 6am, depending on weather and tides. They work around 800 crab and lobster pots, hauling and checking them every other day. This way the crew is selecting the best quality Cornish shellfish caught in each pot, whilst returning young lobster and unwanted species to the sea alive – no dead discards here! In order to reduce fish waste and support local fishermen, The Cornish Fishmonger offers a free bait service to our shellfish fishermen, Alan is one of them. “Most of our bait comes from waste bones after Rob’s fish has been filleted; this is a great way to re-use their waste and it’s really sustainable – the shellfish love it as well! (Alan)”.